Long before becoming a state park, Stone Mountain was settled by families of English, German, Irish, French and Scots-Irish descent who built the log homes, farms, mills, churches and schools needed for self-sufficient communities. A restored 19th century mountain community, the Hutchinson Homestead, is located within the park. Stone Mountain State Park was established in 1969 when the efforts of local citizens led to the acquisition of 1,463 acres of land. Part of the land was donated, and its value was used as the state’s matching fund for grants from the Land and Water Conservation Fund and the Appalachian Regional Commission supporting purchase of the initial land for the park. Since then, Stone Mountain State Park has grown to become one of the largest units in the state parks system. Its combination of highly significant biologic, geologic, scenic, recreational, and archaeologic resources makes it one of the premier units of the system. Stone Mountain is located on the eastern edge of the Blue Ridge escarpment in the Mountain Province of North Carolina. It is on the northern border of Wilkes County, approximately 17 miles northeast of North Wilkesboro, and extends into the southeastern portion of Alleghany County. The park is accessible via U.S 21, S.R. 1002, and the John P. Frank Parkway, between Sparta and Elkin. and is composed of biotite granite. Numerous creeks flow through the park and form several waterfalls. Stone Mountain Falls, located on Big Sandy Creek at the southeast end of the mountain, is the highest waterfall, with a vertical drop over 200 feet. The lowest elevations are along the East Prong Roaring River. A large expanse of steep, wooded terrain extends north and west from the river to the Blue Ridge escarpment. Among the significant geologic values is Stone Mountain, an exfoliation granitic dome rising 700 feet above the valley floor. It is the largest plutonic monadnock in the state. The light gray, medium-grained biotite granite forming the mountain developed from magma several miles deep in the earth. As erosion removed the overlying granitic rock, the resulting release in pressure caused the rock mass to move upward and intrude into older surrounding rocks sometime during the mid-Paleozoic era, 200 million years ago. Wolf Rock and Cedar Rock within the park are similar in structure. The proximity of these plutonic features to the Blue Ridge escarpment is of unusual geologic interest. As a result. Stone Mountain was designated as a National Natural Landmark in 1974. The topography and microrelief, combined with substrates ranging from bare rock to fairly well-developed soil, support significant and diverse biologic values within the park. Natural communities include Acidic Cove Forest, Pine-Oak Heath, Chestnut Oak Forest, Dry-Mesic Oak-Hickory Forest, Low Elevation Rocky Summit, and Low Elevation Granitic Dome. Wolf-Cedar Rock Natural Area features extensive development of outcrop communities that are excellent illustrations of the successional sequence in the various stages of granite colonization,from lichen to moss to herb to shrub to forest communities. Thirteen rare plant and animal species, including two endangered species, have been reported in or near the park. The park also protects over 200 species of vascular plants. In addition to the significant scenic values of Stone Mountain and Wolf and Cedar Rocks, the park includes four waterfalls: Stone Mountain Falls, 200 feet in height; Middle Falls, a seriesof low slides; Lower Falls, approximately 25 feet in height; and Widow’s Creek Falls. The northwestern vistas, a panoramic look at the Blue Ridge escarpment, are the most scenic in the park. The most extensive vistas can be best viewed from Wolf Rock. Seventeen miles of cascading trout streams within the park add to the beauty of its exceptional mountain scenery. North Carolina Division of Parks and Recreation. Stone Mountain State Park. http://www.ncparks.gov/stone-mountain-state-park (accessed December 18, 2015). Trivette, Larry, and Lea J. Beazley. 2002. "Our changing land: Stone Mountain State Park." [Raleigh, NC]: N.C. Division of Parks and Recreation. http://digital.ncdcr.gov/cdm/ref/collection/p249901coll22/id/129996 (accessed December 19, 2015). North Carolina. 1996. Stone Mountain State Park. Raleigh, NC: Division of Parks and Recreation. Morse, Thomas W. 1971. Master plan: Stone Mountain State Park. [Raleigh, N.C.]: The Division. https://archive.org/details/stonemountainsta71unse (accessed December 19, 2015). North Carolina. 1994. General management plan for Stone Mountain State Park. https://archive.org/details/stonemountainsta1994unse (accessed December 19, 2015). Freeman, David B. 1997. 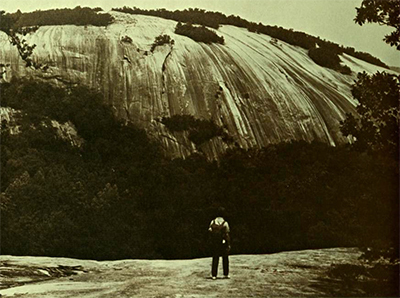 Carved in stone: the history of Stone Mountain. Macon, Ga: Mercer University Press. Hollis, Tim. 2009. Stone Mountain Park. Charleston, SC: Arcadia Pub. [Hiker looking at rock face.] Photograph. 1970. From Stone Mountain State Park Master Plan, N.C. Division of Parks and Recreation. 1970. https://archive.org/details/stonemountainsta71unse (accessed December 30, 2015).